I bought the bike new in 2008 after owning a long list of bikes over the years (currently at 29 overall) with this bike being the favorite. 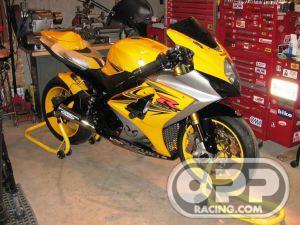 My GSXR and I have had quite a history and after lengthy hours in my shop and many $$ spent this is the outcome. This bike is no trailer queen, it is ridden like it was meant to be ridden – hard, and currently sits with 30,000km waiting for the 2012 riding season to start. Oh ya funky pewter Skull Key!